An ancient Angkor temple has re-opened in Cambodia following decades of reconstruction work – a task described as the world’s largest puzzle. 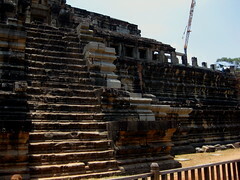 The work has involved taking apart the Baphuon monument’s 300,000 sandstone blocks and piecing them back together. The project began in the 1960s but was interrupted by Cambodia’s civil war, and restarted in the mid-1990s. The 11th-Century three-tier tower is part of the Angkor complex which draws two million tourists a year.